Get creative with these fun chocolate shortbread cookies! 1. For the shortbread, beat the butter with the granulated and icing sugars until light and fluffy, about 3 minutes. It’s an important step to beat the butter and sugar well together when making shortbread – this ensures the shortbread will hold together and when you take a bite it will ‘snap’ and then melt away. 2. In a separate bowl, sift the flour, cocoa powder and salt. Add this to the butter mixture and stir until evenly blended. Shape the dough into a disc, wrap in plastic and chill until firm, about an hour. 3. Preheat the oven to 325 F and line a baking tray with parchment paper. 4. Unwrap the dough and knead a little just to soften, making it easier to roll. Roll the dough out on a lightly floured work surface until it is just over 1/8-inch thick. 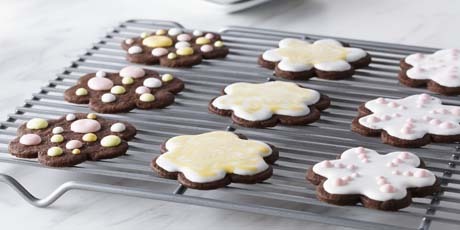 Cut out cookies using a 2 ½ -inch fluted cutter and place carefully on the baking tray, re-rolling the dough if needed. Bake the cookies for 13-15 minutes until they lift easily when lifted with a spatula. Cool the cookies on the tray before removing. 1. For the royal icing, mix all ingredients in a stand mixer fitted with the paddle attachment and beat until it comes together, and is fluffy, about 5 minutes. 2. To make a ‘flood’ style of icing, that spread over the surface of the cookie, add just a little more water until it is a consistency that spreads on its own but does completely cover the cookie (thicker than glaze). You can always adjust by adding more water or icing sugar, as needed. Add food colour paste in small amounts, as desired. 3. Spoon the icing in a piping bag with a small plain tip or a parchment paper cone. Pipe an outline on the cookie and then fill it in with icing, or pipe dots and use a toothpick to swirl colours. Allow 2 to 3 hours for the icing to dry. 4. The cookie will keep for up to 5 days in an airtight container.